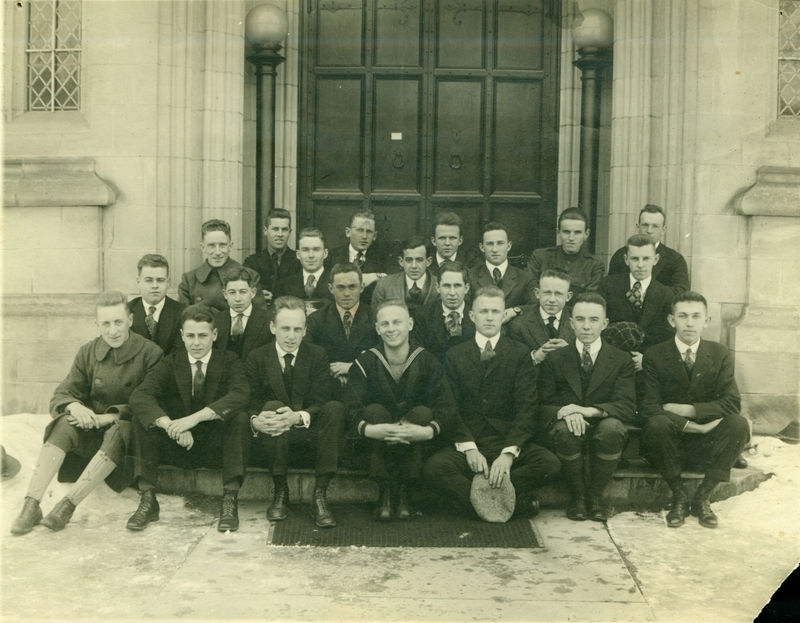 Group portrait of the fraternity members, taken on the steps of Hubbard Hall. Front row: Maurice A. Morin, William F. Clymer, Ernest M. Hall, Maynard S. Howe, Ralph B. Knight, Cecil F. Thompson, Ralph E. Starrett. Second row: John L. Berry, Maynard C. Waltz, Harold S. Prosser, Allan W. Sylvester, Cloyd E. Small. Third row: Everett H. Wass, Harold B. Sawyer, Glenn Farmer, Fred B. Chadbourne, Lloyd H. Hatch. Back row: Ellsworth M. Gray, Paul C. Marston, Frederick W. Anderson, Carroll L. Bean, Harry L. Curtis.